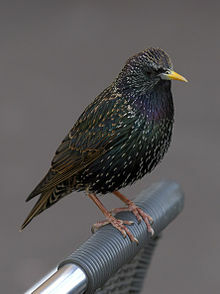 ↑ "Sturnus vulgaris". IUCN Red List of Threatened Species. Version 2013.2. International Union for Conservation of Nature. 2012. Retrieved 26 November 2013. ↑ Gill, Frank; Donsker, David. "Sugarbirds, starlings, thrushes". IOC World Bird List 2013 (v 3.3). Archived from the original on 24 March 2010. Retrieved 9 April 2013. ↑ Vaurie, Charles (1954). "Systematic Notes on Palearctic Birds. No. 12. Muscicapinae, Hirundinidae, and Sturnidae". American Museum Novitates. 1694: 1–18.